Centaurs were a race of beings half-horse and half-human (the head, torso, and arms of a man, and the body and legs of a horse), who lived in the mountains of Thessaly (Thessalia, the district of northern Greece south of Macedonia) and Arcadia (Arkadhia, mountainous region of the central Peloponnesus). Generally lawless and inhospitable creatures, the most famous Centaur, Chiron, was the most gentle soul in Greek Mythology. He lived at the foot of Mt. Pelion in Thessaly and was the son of Cronus and Philyra (although some say his father was Zeus). Apollo and Artemis both taught him, and Chiron earned fame for his skills in hunting, music, prophecy, botany, astronomy and medicine. He taught many Greek heroes, especially the great physician Esculapius (son of Apollo and Coronis, who later became the constellation of Ophiuchus) and the famous Greek warrior Achilles. Hercules was another of Chiron's students, but accidentally shot his teacher with a poisoned arrow. Since Chiron was immortal, he couldn't die from the poison, but he felt the pain like any mortal. He wanted to die! Feeling guilty Hercules spoke to Zeus about the problem. Zeus thought of a solution: Prometheus, the Titan, remained chained to a rock for stealing fire from Olympus and giving it to mortals. Zeus told Hercules that Prometheus could be freed only if another immortal was willing to become mortal. Zeus permitted Chiron to die in peace and Prometheus was freed. This sad, but sacrificial story characterizes the gentleness of a Centaur named Chiron. Each map can be clicked on to produce a 909x1199 version of it. They sport red labels, which look good on screen, but which disappear when used with red flashlights. Each map, therefore has a second link to a map better suited for printing in a graphics program, and using in the field. While they are quite large, they are all about 30-60k, and so are easy to view at today's modem speeds. The first map is a wide area view of the constellation, suitable for naked eye browsing. The next views are binocular width, showing stars to mag. 10, and labeling deepsky objects to magnitude 12. Click the map for a 909x1199 version of the above. Click here for a map better suited for use in the field. This is the north-east section of the constellation. The map displays stars to magnitude 10, and deepsky objects to magnitude 12. Click here for a map better suited for use in the field. Click here for a map better suited for use in the field. 76k JPEG NGC5617 (Bennett 65) is a mag. 6.3 open cluster located 1.2° west of Alpha Centauri, just north of an imaginary line drawn between Alpha and Beta. Dreyer's description reads: Large (10'), richer in stars to the west (about 80 total), with a compressed middle. It contains stars of magnitude 8 and fainter. While visible in binoculars as a hazy patch, a 6" begins to resolve the cluster well at higher magnifications. From the Digital Sky Survey. Map Printable Map More info. 78k JPEG NGC5460 is a mag. 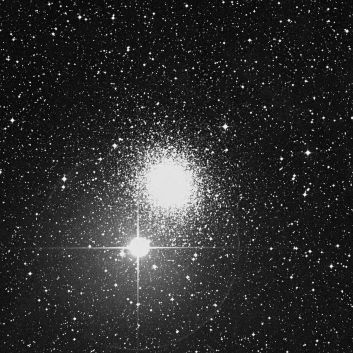 5.6 open cluster located 2.3° ESE of Zeta Centauri. Described as very large (25'), and very little condensed, it has about 40 stars mag. 8 and fainter. The small (2.8'x1.7') galaxy at the top of the image is the mag. 12 ESO221-26. From the Digital Sky Survey. 42k JPEG NGC5286 (Bennett 64, Caldwell 84) is a globular cluster located 4.3° SSW of Zeta Centauri. Described as very bright (mag. 7.6), fairly large (9'), round, and extremely rich, it has stars mag. 15 and fainter. From the Digital Sky Survey. 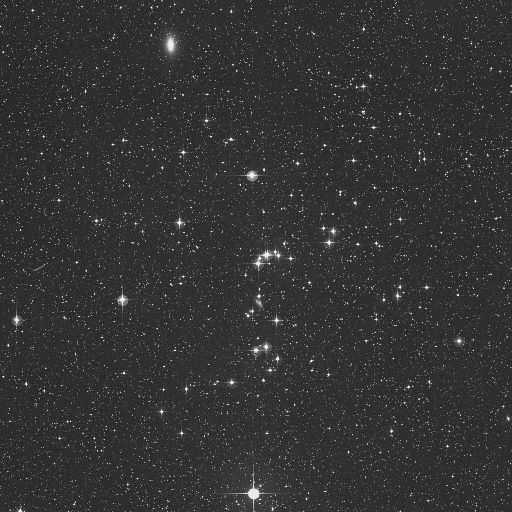 98k JPEG NGCs 5281 and 5316 are two open clusters in a rich field. 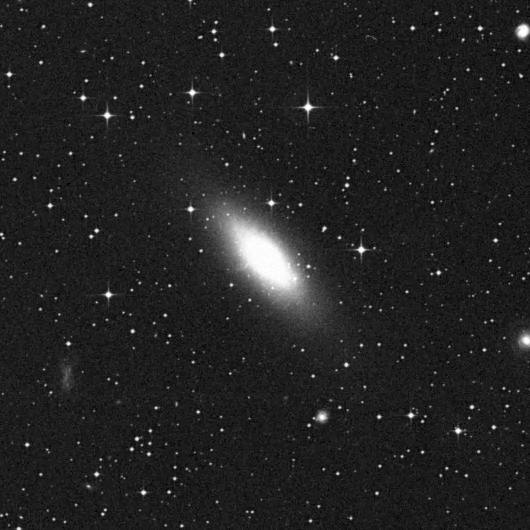 NGC5316 lies 1.2° north-west of NGC 5281. 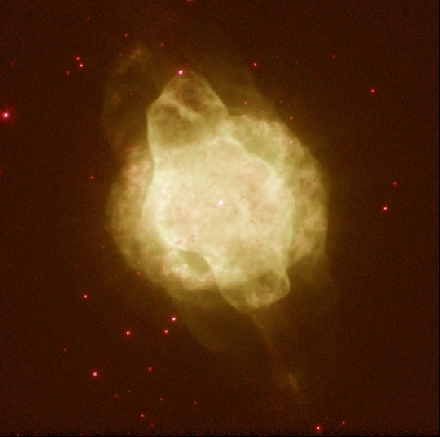 NGC5316 is located 1.9° south-west of Hadar (Beta Centauri). NGC5316 is described as fairly large (14'), fairly condensed, with about 50 stars mag. 11 and fainter. Overall magnitude is 6. NGC 5281 is bright (mag. 5.9), small (5'), and fairly condensed, containing about 20 stars of mags. 10-12. 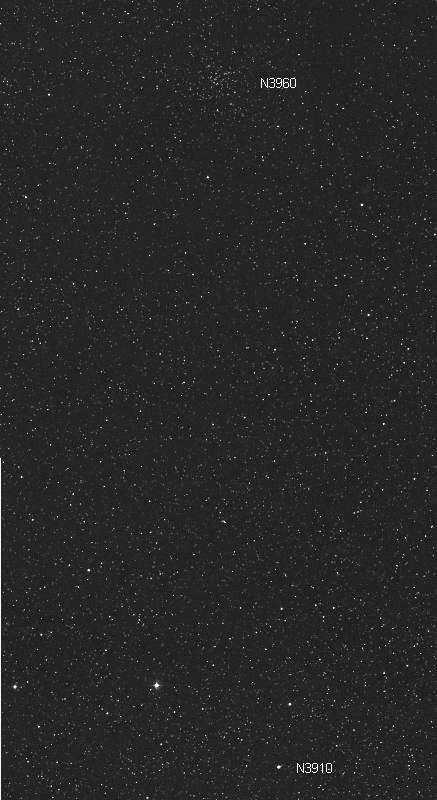 Mosaic created from the Digital Sky Survey. Map Printable Map 378k JPEG. 40k JPEG NGC5253 (Bennett 63a) is an irregular galaxy located in northern Centaurus near the Hydra border. It forms an equilateral triangle with 6-7° sides with the stars Theta and Iota Centauri. It also lies 1.8° SSE of M83 in Hydra. NGC5253, M83, NGC4945, NGC5128, form a physical association. 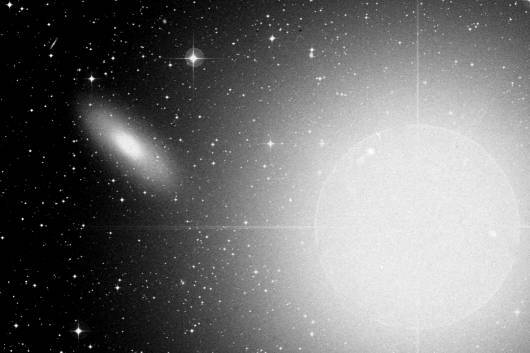 Dreyer describes NGC5253 as bright, fairly large, and extending in roughly p.a. 45°. It brightens westward abruptly toward a much brighter middle. While this brightening is true for larger telescopes, a 6" will show an evenly illuminated oval. Image from the Digital Sky Survey. 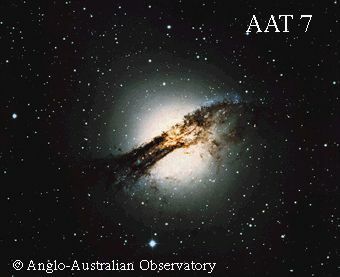 NGC5128 (Bennett 60, Best 17, Caldwell 77) is also known as the radio source, Centaurus A. Strong radio emissions indicate something strange going on inside this galaxy, and the appearance bears this out. Some viewers call this the "Hamburger Galaxy," for the dark meat patty between two pieces of white bread effect, easily visible in a 6". Located 4.5° west of Mu Centauri, and the same distance north of Omega Centauri, Dreyer calls it a very remarkable object. Very bright (mag. 7.2), very large (18'x15'), and very much elongated (P.A. 122), the dark center band divides it neatly in two. 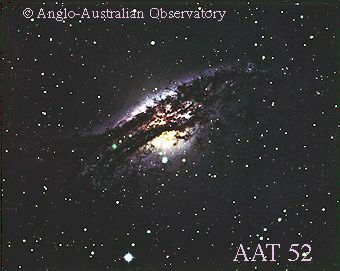 Two photos from the Anglo-Australian Telescope, the second showing more detail in the central band. 28k JPEG Color shot of Omega Centauri (NGC5139, Bennett 61, Best 18, and Caldwell 80), 1 minute red, 3 minute green. 5 minute blue, shot by Tim Puckett at WSP with LX200 and ST6. Omega resembles a fuzzy star to the naked eye, but resolves into the premier globular cluster of the heavens in any sized telescope. Dreyer confirms this by giving it a triple exclamation point. He calls it bright (mag. 3.7), extremely large (36'), extremely rich, and very, very condensed. The stars are mag. 11 and fainter. Located 4.8° west of Zeta Centauri. 21k JPEG NGC5102 is a spiral galaxy located near (17') Iota Centauri (the grossly overexposed star in the image) in northern Centaurus. Described as very bright (mag. 10), large (8.8'x2.9'), and elongated, it has a sharply defined nucleus. Heavily processed image is from the Digital Sky Survey. Let the image be your guide; use higher magnifications, and keep Iota out of the field of view. 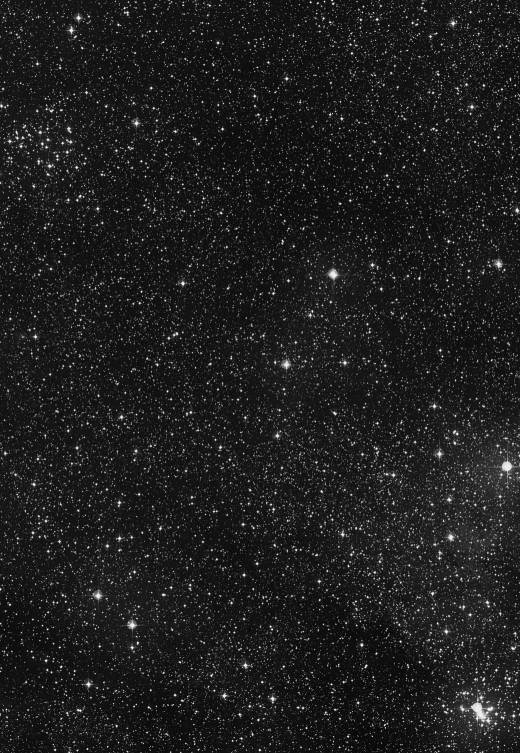 Two images of NGC4945 (Bennett 57, Caldwell 83) from Le super NGC Catalogue! and a wider area mosaic from the Digital Sky Survey. NGC4945 is a nearly edge on spiral galaxy described by Dreyer as bright (mag. 9.2), very large (20'x4'), and very much elongated (P.A. 39). It is located between Xi2 and Xi1 Centauri (visible in the mosaic) in the center of this huge constellation. Many other galaxies inhabit the Digital Sky Survey mosaic. Amateurs should have little difficulty with NGC4976, (Bennett 58) 3.3° east at the left side of the image. It shines at mag. 11. NGC4945a to the south of the main galaxy shines at mag. 13. ESO219-27 shines to its south. ESO219-22 and ESO219-22a shines on the western end (right side) of the picture. These galaxies shine at 14.5 and fainter. 28k JPEG Caldwell 100 (IC2944) is a mag. 4 open cluster with nebulosity almost centered on Lambda Centauri near the Crux border. Dreyer describes it as a mag. 3.4 star (Lambda) embedded in a very large (60'x35') nebulosity. Visually the nebulosity looks nothing like the photograph from the Anglo-Australian Telescope; it is fairly faint. The associated cluster has about 30 scattered stars at mag. 6.4 and fainter. 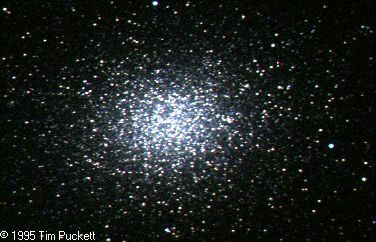 63k JPEG Caldwell 97 (NGC3766) is a mag. 5.3 open cluster located in the Milky Way 1.4° north of Lambda Centauri near the Crux border. Dreyer describes it as fairly large (12'), fairly rich, and fairly condensed, containing about 100 stars mag. 8-13. From the Digital Sky Survey. The Blue Planetary (NGC3918) is one of Dreyer's remarkable objects. It is small (12"), round, blue, and looks like a defocused mag. 7 star (actual brightness is described as 8.4). There is a central star at mag. 13.3. It lies mid-way between Delta Crucis and Pi Centauri near the Eastern Crux border. 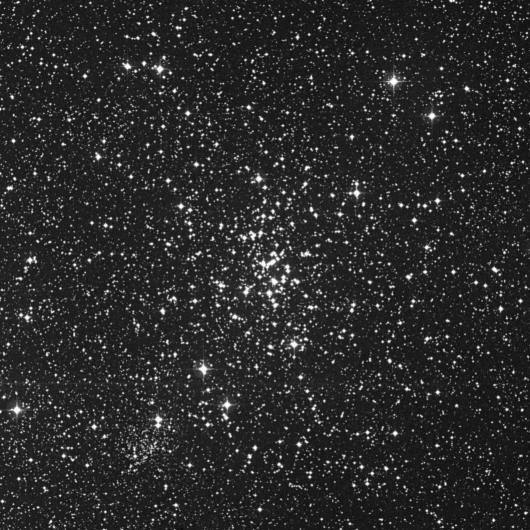 NGC3960 (Bennett 48) is an open cluster located 1.5° north of NGC3918. Dreyer describes it as fairly large (7'), becoming richer in stars and brighter. It contains about 45 stars of magnitude 11.5 and fainter. Total magnitude is 8.3. Image on the left is a labeled Digital Sky Survey mosaic containing both objects. The planetary nebula looks stellar. Image on the right is an exquisite, false color, Hubble Space Telescope Image of NGC3918.